A few weekends back I got to experience the World Food Championships, Scottsdale Regional where home cooks, culinary students and local chefs competed in 3 categories for a chance to win their way to Vegas and ultimately become the World Food Champ. I was asked to be a food judge and was slotted at the end of the day for the cheese category. Seafood was up first and I couldn’t help be taken in by the action as the cooks fired up their stoves. I watched intently as they expertly prepared their dishes and plated them for the judges. What really caught my eye was Chef Gregory Wiener’s dish, Crispy Barramundi & Flavors of the Ocean. 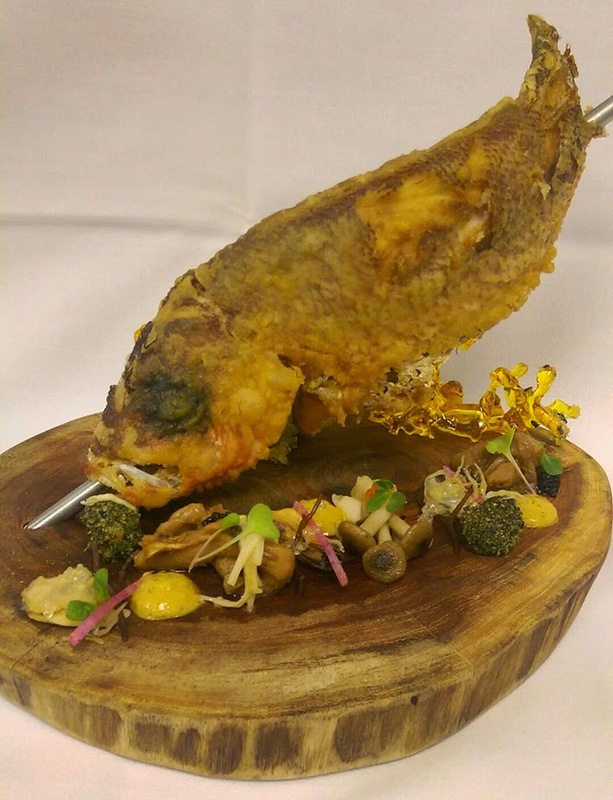 The Barramundi was perched on a wooden plate and surrounded by vegetables and other seafood. It looked like a masterpiece. Born into a culinary household, Chef Wiener, along with his younger brother, grew up in the kitchen of his family's Wisconsin restaurant. He attended school at the Culinary Institute of America in NY and worked at a variety of restaurants in NY, California and Arizona before landing at the Marriott Phoenix at the Buttes, in Tempe. Chef Wiener is not a novice when it comes to food competitions. He's been competing and winning since 2004. When asked how he came up with the seafood dish for the World Food Championship he said, "when it comes to these sorts of events he tries to get in the minds of the judges and give them something they will like but have never seen before." At the same time he realizes that he can’t be overly creative and needs to cook at a level that most people will understand. Inspired by the Friday fish fry, at his parents restaurant, and remembering how people lined up at the door, Chef Wiener decided to embrace the seafood theme. Taking seafood to the next level he presented the judges with not only the barramundi but with several varieties of fish. Wiener says he went through several dry runs of the entire process and even built custom pieces for presenting. In the end he was really happy with how the fish turned out, and feels that’s the most important thing when competing. The minute I laid eyes on his Crispy Barramundi I knew it was a winner and win it did! Chef Wiener is going to Vegas later this month with a new and exciting seafood dish to wow the judges with..who is coming to cheer him on? That is some presentation on that fish platter :-) I love reading about chefs and their inspiration. Thanks for sharing. Wow. I've never heard of that fish and never, ever seen such a presentation! Looks very dramatic and love barramundi! We're very lucky to have it available to widely here in Australia! Wishing Chef Gregory Wiener good luck and a lot of fun! What a gorgeous presentation, and somehow I feel like it tastes equally wonderful!